A couple of weeks ago my friend Leah was super nice and stopped by my office with a salad she had picked up for me at a nearby restaurant . (Friends bring you ice cream. Real friends bring you salad. Everyone knows that.) The restaurant had called it a tropical salad. It has lettuce, apple and mango, and a delicious dressing. I immediately began thinking of how I would recreate it. 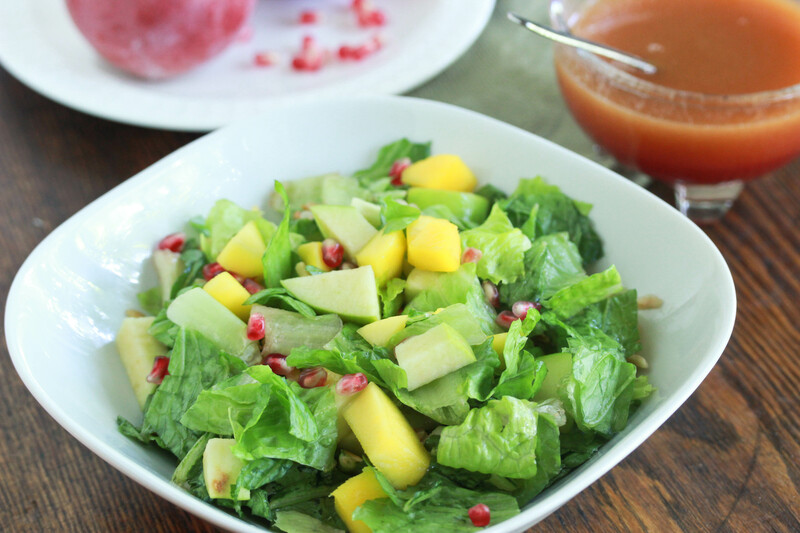 Then the folks over at Pom Wonderful were kind enough to send me a couple of bottles of pomegranate juice, and I immediately knew I would be making the pomegranate version of this salad. Seriously, the pomegranate juice is kinda like magic when making a salad dressing. Now, some of you might think this looks familiar. I recently posted a recipe for a lettuce salad that had a fruity nature to it. But really, that’s all these two have in common. I know I said that one was my favorite, but it now has competition. Want to make this delicious salad at home? How about a case of Pom Wonderful’s new 8 ounce bottles to get you started? That’s right! I am giving away a case of this juice to one lucky reader. PS- there’s gonna be some more pomegranate juice recipes on this blog soon…so you definitely want to win! Prize is a case of 8 ounce bottles of Pom Wonderful’s pomegranate juice. Giveaway ends at 11:59 PM on Thursday, September 20th. Prize can only be shipped within the continental US. Required Entry: Leave a comment on this post telling me what is your favorite recipe that involves pomegranates. For additional entries: note: each entry requires it’s own comment. Duplicate entries in the same comment will only be counted once. Disclaimer: Pom is sponsoring the giveaway and has sent me pomegranate juice for recipe testing. Opinions are my own. Whisk all ingredients together until smooth. Set aside to pour over salad. Combine lettuce, fruit and nuts/croutons (if using) in a bowl. Drizzle with vinaigrette (you will not need the full amount for this salad. Dress according to taste.) Serve immediately. Note for Rosh Hashanah- you can make this with lemon juice instead of the vinegar. It’s not the same, but still delicious. You can omit the nuts, or use croutons. Last night I made Bosc pears roasted with a pomegranate juice/red wine/orange peel reduction sauce. The flavor of the sauce was delicious. I would love to win the Pom juice. I can’t give you an actual recipe that I use, mostly because I don’t use that many written recipes anymore. However, I do make a nice salad that contains pomegranate seeds. I usually use a balsamic vinaigrette, but I think that next time I will try your pomegranate dressing. Pomegranate juice is great mixed into a fruit salad. I sprinkly pomegrante arils on everything from salad to desserts, have used Pom in fish and chicken recipes as well. My fave is pomegrante tarts for dessert. It’s not really a recipe, but I love mixing Pomegranate seeds into Greek yogurt. I love a blueberry and pomegranate smoothy. I take 10 blueberries and I juice half a Pom. And add it to 1 cup of ice an a cup of whole milk (forget your diet). Blend it and add 3 tblspoons of sugar (the good stuff) . Pour in to a tall glass , add a little umbrella and drink through a straw and enjoy! 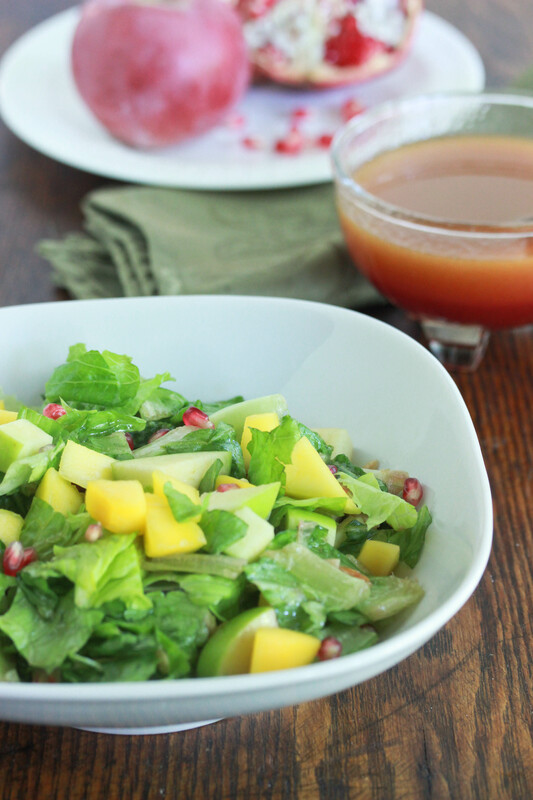 Not such a pomegranate fan… but LOOOVE your blog and this salad might become my new favorite! I love to drink POM plain. There’s nothing like using the anti-oxidents to kill the free radicals who shouldn’t be free anyway!!! Loved braised brisket in pom juice. Made that last RH and it was delicious! pinned to you on pinterest too. OBSESSED? LOVE this recipie–definitely want to try to make it for RH- looks refreshing and delicious, very festive, and reminds me that summers almost over:( I happen to love pomegranates and when they are in season, I eat a whole one for snack! ( I hope you have one of those amazing devices that seeds it) I love the way they taste in salads and especially fruit salads ( with kiwi, mango…) I am going to try to make that pomegranate sorbet–looks delicious too!! Thanks for all the awesome recipies I already made so many things for Y”T with the RH roundup recipies… i just keep checking my computer for more! keep them coming!!! Not entering the draw but that does look like a wonderfully refreshing salad. I’m a fan! I’m a fan! I love a pomegranate fruit salad! I make a delicious pomegranate chicken. I made a pomegranate iced almond cookie for Rosh Hashannah. I use the juice with balsamic vinegar and make a reduction to go along with salmon. I like pomegranate ice cream. Is that weird? I’m not a huge pomegranate fan, love the taste, hate the seeds. So I don’t have many recipes (I do usually add the ones from Rosh Hashana to a salad for second day) but I would love to try some recipes with the juice. I already follow you on Twitter. And I love Pom Wonderful. I already like you on Facebook. And I love Pom Wonderful. I already follow you on Pinterest. And I love Pom Wonderful. What a refreshing salad. I have to say my favorite pomegranate recipe is a yogurt parfait that I make with pomegranates and ground pistachios. Perfect in every way! Pomegranate Glazed Salmon by The Shiksa in the Kitchen is absolutely delicious http://theshiksa.com/2012/09/06/pomegranate-glazed-salmon/. Also amazing is here Pomegranate Molasses Brisket http://theshiksa.com/2011/09/15/pomegranate-molasses-brisket/. I made both this Rosh Hashanah (as well as this great salad) and every mouthful was a treat. Ooh. I would like Pom juice! I don’t have a recipe to leave you… Like Rochel (above) I have never used pomegranate in a recipe… I know, right? But I am very allergic to mango. What else could you put in here? I don’t have a favorite recipe yet but would love to find one with POM juice!